I specialize in helping First Time Home Buyers purchase their first home. From our Initial Consultation until the day of close and after I will help to guide you the process of purchasing your first home. I also provide a Guide for First Time Home Buyers to help outline the home buying process. 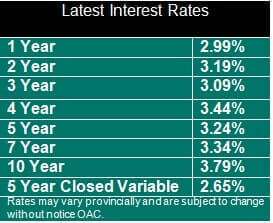 Whether you are purchasing a New Property or are need of additional funds from your existing property, I can help get you the Best Interest Rates. As I have access to Over 60+ Lenders the banks compete for your business. I have access to a number of lenders that are not confined by the newly imposed Stress Test requirements set out by the government. Contact Me for more details! Is it close to the time where you need to Renew Your Mortgage? In most cases I can Beat Your Bank's Interest Rate by selecting from multiple quotes offered to myself by a wide array of Mortgage Lenders. Our No Fee Transfer Program makes renewing your Mortgage Easy and Free! Many New Immigrants, although in a sound financial position, lack an established credit history. Although this can be a major obstacle with the major institutional lenders, I have access to lenders with Specialized Financing Programs specifically designed to Help New Immigrants obtain Mortgage Financing. Whether it is a Commerical or Residential Investment Property, I can Help! I have Commerical and Residential Lenders who specialize in Investment Properties. I have Lenders that Specialize in Rent to Own financing! While it is often considered a niche market, I have access to lender which do Leased Land Mortgages. We can meet at my Office , at your home, or speak over e-mail or text - 519-860-2102. If I can help you with these or any other of your financial needs please do Contact me.